This 7.62 NATO ammunition was produced in the 1980s by Syarikat Malaysia Explosive Ltd, which is now known as SME Ordnance. 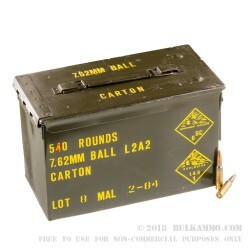 Each lot of 540 rounds comes packaged in a reusable steel ammo can with a sturdy latch and carry handle. As military surplus, this ammo is relatively inexpensive yet highly reliable. These cartridges fire a 146-grain bimetal jacketed bullet and produce trajectories comparable to those of M80 ball. Expect solid performance in a variety of .308 Winchester and 7.62x51mm rifles including the M-14, FAL, and a wide variety of bolt-actions. Like all mil spec ammo, these rounds have cases with visible annealing marks, which are usually polished away on commercial ammo. These cartridges differ from more recent military production in their use of non-corrosive Berdan primers, which are very dependable but cannot be removed from the casing as easily as spent Boxer primers. 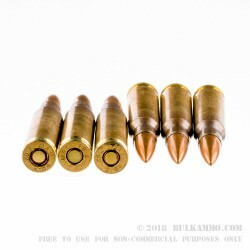 Reloaders may want to choose another of BulkAmmo.com's great selection of .308/7.62 loads. bad rounds or opperator error! Much better than the price suggests. First off, this round seems to severely overgas my AR10 (around 2 revolutions on my adjustable gas block when switching from Federal GM),so it is advisable to get an adjustable gas block along with this ammo. Performance wise I was getting around 2 MOA groups out of a 16 inch LFA that can do just sub-MOA groups with GM. Skeptical of Some Reviews Here. Clean , bright ammo in a sealed can. I would've bought more but the price went up and I found a better deal. Great Ammo. Will buy more! I've only shot 20 rounds in my PA 10 but have had no ftf"s or fte"s.
Great price for range or Rambo! What to say about this ammo, first can I had multiple fail to fires dated 1974, Recessed primers my worst case scenario, pin mark dead center no bang live round a huge number of failures per rounds fired. Second case dated 1984. All of them perfect. This ammo has some fliers but not large enough to complain about for price..Not sure I would want to have to trust it in the woods. If you practice proper technique unloading misfire your ok, but I sure don't like the regularity of the click no bang. 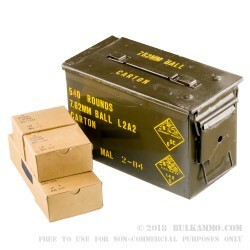 Great ammo at a very good price. Excellent product, excellent price per round. Well my two boxes that I ordered came in today as always the packaging was good. Opened the cardboard boxes and the outsides of the ammo cans looked a little like hell. Dirty, dinged and one looked like someone spilled a soda on it. So I decided to open the ammo cans and the inside is pristine! The ammunition looks like it just came off the showroom floor. The seal on the ammo can had the lid sealed tighter than the lid on a pickle jar! I almost couldn't get it open. But when I did, it was worth it. Q: I read in the reviews that the casings are not re-loadable. Is this true? A: Hi Paul, These cartridges differ from more recent military production in their use of non-corrosive Berdan primers, which are very dependable but cannot be removed from the casing as easily as spent Boxer primers. 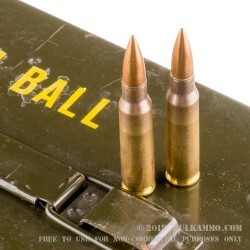 Reloaders may want to choose another of BulkAmmo.com's great selection of .308/7.62 loads. Q: Is this steel ammo? Will it pass magnet test? A: No, the jacketing is bi-metal, which means that there is steel in it. It will attract a magnet.